Wide as the Wind is the winner of the 2017 Next Generation Indie Book Award for Young Adult Fiction, the 2017 Silver Moonbeam Children's Book Award for Young Adult Fiction - Historical/Cultural, and the 2018 silver Feathered Quill Award for Teen Fiction. 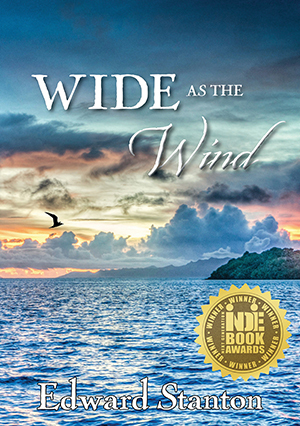 Wide as the Wind was also honored in the 2018 Purple Dragonfly Book Awards in Green Books/Environmental. Wide as the Wind is the first novel to deal with the stunning, tragic history of Easter Island (Vaitéa). It could be described as quest fiction for all ages in the line of Tolkien’s The Hobbit, but it is set in the real world, not Middle-earth. Wide as the Wind portrays Polynesian voyages across the Pacific Ocean in canoes with no metal parts or instruments: the greatest adventure in human prehistory, as bold as modern space voyages (National Geographic). Click here for a free bonus chapter from Wide as the Wind! It tells the story of how Miru earned his secret name, not revealed within the novel itself. Our Price: $16.95 + $3 S+H for one or more copies in continental US. Contact us for school and book club discounts. 220 pgs - 5.83 in. x 8.27 in. "Protagonist Miru is a valiant hero, sailing into the sunset and bringing back trees and plants that are essential to the viability of his close-knit community. Miru is well-developed, and he’s featured in an engaging subplot of a chaste romance, sustained even through a long separation during his seafaring years. Miru’s extended family is large, and many additional interactions between him and members of the community showcase his coming-of-age. For readers who appreciate intricately detailed storytelling, the payoff is a strong sense of Polynesian culture in a novel whose style is reminiscent of James Michener’s. Stanton spent many years as an English literature professor, and his craftsmanship reflects this background. VERDICT: Recommended for ambitious middle and high school readers who appreciate a depiction of a little-discussed but significant historical period and culture; for large historical fiction collections." "Wide as the Wind transports us to an island world both outside time and urgently relevant to us in the 21st century. At the center of the story stands fifteen-year-old Miru, an extraordinary young man who is called upon to forsake passion, family, and security in a quest to restore his island so it might sustain his people again. This novel reminds us of what is important and what we might be called upon to set aside in order to make a world where we and our descendants can live and thrive." "Years of tribal wars between the Tuus and the Raas have savaged the tiny Polynesian island of Vaitea. Those tribespeople who survive the massacres are slowly starving to death. The high priestess Marama believes 15-year old Miru is the chosen one and tasks him with saving the island and its people from total destruction. . . . During their long treacherous journey, Miru finds within himself not only strength and determination but the true answer to saving Vaitea—peace. Miru understands that in order to save the environment he must first save his people from themselves. . . . Stanton paints the ravages of Vaitea's war and the splendor of Ragi's paradise in vivid detail and poetic prose. Stanton has sculpted a modern parable that shows how mankind's hatred and violence sow the seeds of environmental devastation. . . . Wide as the Wind is an inspiring adventure about the bravery and courage of three young earth warriors who save the future." "In the midst of a forbidden love, young Miru sails across dangerous Polynesian seas to find new seeds and trees for his island that has been ravaged by war. Wide as the Wind is a lyrically crafted novel of love and adventure as well as a cautionary tale for the survival of the earth and our human species. It now forms part of what has been called 'the environmental imagination.'" "Wide as the Wind speaks to a fundamental truth: our need to protect the planet’s environment." "Wide as the Wind takes place many years ago, yet it can speak to readers of all ages and backgrounds in a timeless way about the result of neglecting Earth’s natural environment. . . . Wide as the Wind is vividly tragic and dramatically rich. It’s a historical tale without feeling historical. Featuring themes of adventure, war, and a comparable Romeo and Juliet type romance, this novel is perfect for readers weary of history and anthropology but zealous for adventure and drama." "Miru is . . . a young man to fight for!" Edward Stanton's Wide as the Wind is based on ten years of travel and research on Easter Island, whose name he has changed in his novel in order to extend its imaginative reach to all of Polynesia. Born in Colorado and raised in California, he resides in Kentucky after having lived in Mexico, Argentina, Uruguay, Chile and Spain. Stanton is the author of eleven books, some of which have been translated and published in Spanish, Arabic and Chinese. Road of Stars to Santiago, the story of his 500-mile walk on the ancient pilgrimage route to Compostela, was called one of the two best books on the subject by The New York Times. Pulitzer Prize-winning writer James Michener said, "Edward Stanton recounts his adventures with stylish conviction." Stanton has also published fiction, poems, translations and essays in magazines, journals and newspapers in countries throughout the world. He has been a professor of literature at universities in the U.S., Europe and South America. The Fulbright Commission and the National Endowment for the Humanities have awarded him grants for travel, research and writing. 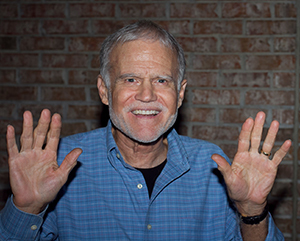 His students and colleagues recently published a volume of essays in his honor. At present he is completing a travel memoir titled VIDA: A Life.